100% PURE RAW & UNFILTERED AMERICAN HONEY - Made in the USA and straight from the hive - from our family to your family! Rice`s Honey proudly partners with local beekeepers around the country to provide only 100% pure, authentic, high quality, raw & unfiltered honey in a wide variety of local blends. Nothing is ever added and all the nutrients remain in each bottle, including such healthy nutrients as vitamins, minerals, antioxidants, amino acids, enzymes, and pollen. Honey is a great alternative sweetener that has many advantages over sugar. 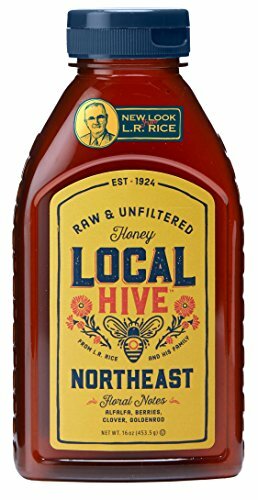 Rice`s Local Northeast Honey is a blend of beautiful flower types and nectars commonly found in the American Northeast. Rice`s Local Northeast Honey contains trace amounts of vitamins, minerals, amino acids and enzymes. US Grade A Strained. Gluten Free. All components of the product and packaging are proudly made in the USA. In 1924, L.R. Rice began packaging premium American homegrown honey straight from the hive and selling it door to door. Today, Nearly 100 years later, Rice's Honey is still a family-run business in its 5th generation of producing, packing and working with local beekeepers to bring you the best American premium honey. Rice's Honey is committed to remaining local, sustainable, and socially responsible, sourcing the highest quality raw honey from around the United States and enabling local beekeepers to share their amazing honey directly with customers like you. If you have any questions about this product by Rice`s Honey, LLC, contact us by completing and submitting the form below. If you are looking for a specif part number, please include it with your message.